This sausage and onion tart is very easy to make as the crust is made with an easy corn meal batter. Don’t be fooled by the picture. It is neither a Pizza nor a Tart. I call it a tart as I baked it in a tart pan and it looks like a tart. It’s more like a Greek open faced pie, which we call “plastos”. This tart was not in the menu yesterday. Actually, I was planning to make Fakes Moudjentra (lentils with rice) and when I opened the closet to get the onions and saw that I had only one small one left. That’s not a problem any more because we still have a lot of onions in our garden. During winter, we planted a couple of varieties and we ate a lot while they were still green. However, we still have a lot and I took a bag with me and pulled some out of the soil. I don’t know much about gardening but I noticed that the bulbs were divided in two, some times in three parts, although each bulb was planted separately and spaced apart. I also noticed something which I never came across with onions I buy from the farmers’ market. The inner part of some of them, where the green leaves used to be, was hard inside, which I had to remove before chopping. Anyway, I put them in the sink and removed the withered leaves. When they were cleaned I took a few photos which I posted on Facebook. While posting a description I wrote “freshly picked onions, now I want to make an onion pie” and without second thought I forgot about the lentils and started thinking how I could make the pie with the ingredients I had at home. Hmmm, I liked the idea. To my regret, I discovered that I had no feta in the fridge because our local supermarket was doing some kind of renovation and all their refrigerators were empty. I did have some leftover grated gouda cheese and had some sausages from yesterday’s recipe Gemista me Loukanika (sausages), which were wrapped and stored in the deep freezer, as i did not anticipate to use them again soon. I noticed that the sausage can be cut much easier as well as removing the casing was easier. As I mentioned in my previous post, don’t use sausages that you do not like. For example, if you don’t like leeks, don’t use sausages which have leeks in them, as that would spoil the taste. You may be wondering why I added some breadcrumbs in the filling. The reason is to absorbe the juices so that the base will not become soggy. While I was sautéing the onions, I prepared the crust. I was rather lazy to start making tart dough and rolling it, so I was lucky enough to have corn meal, milk and eggs with which I used to make a quick batter, which I used as the base of the “tart”. The result was amazing. Sweet onions and delicious sausage, with cheese combined with a delicious, crispy cornmeal crust was more than I expected of this humble pie made out of minimal ingredients! Did I mention that it was so easy to make? Note: If I had the ingredients, I would add some crumbled feta in the batter and would use graviera cheese instead of gouda. Heat the olive oil in a nonstick frying pan and sauté the onions with a little salt until translucent. Remove the casing from the sausage and chop into slices. Add them to the onions and sauté a few minutes. Add the brown sugar and cook until the onions caramelize. Remove the crust from the bread and process to make breadcrumbs in a food processor. Mix in the onions and sausage to absorb the liquids. Simultaneously, in a bowl put the eggs with the milk and beat with a fork to dissolve. Add salt and pepper and corn meal, to make a thick batter. 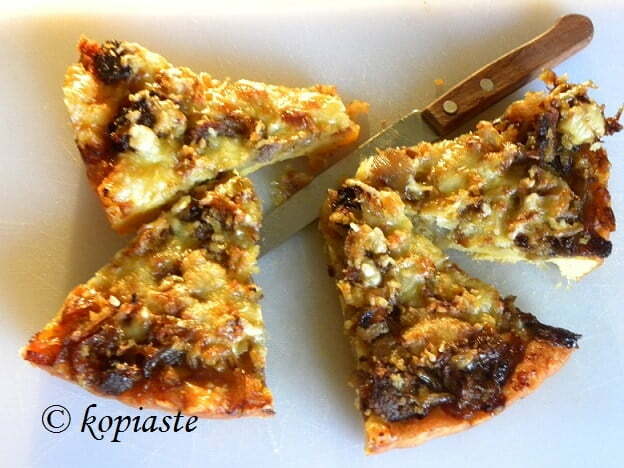 Grease a 26 cm / 10 inch tart pan and spread the batter with a spoon. Add the onion mixture on top and sprinkle some cheese on top. Preheat oven to 180o C/ 350o F, with fan forced oven and lower resistance of the oven. Place the rack in the center of the oven and bake for about 45 minutes, until golden on top. This sausage and onion tart is very easy to make as the crust is made with an easy corn meal batter. Don't be fooled by the picture. It is neither a Pizza nor a Tart. I call it a tart as I baked it in a tart pan and it looks like a tart. It's more like a Greek open faced pie, which we call "plastos". aHeat the olive oil in a nonstick frying pan and sauté the onions with a little salt until translucent. That looks amazing Ivy – that penultimate photo… you can really see how golden and crispy the crust is and the topping sounds incredible. France isn’t that hot on (what I consider) “good” sausages, thought I wonder if it would work well with merguez sausages. I think the spiced fat from the lamb would come out and colour and flavour the crust beautifully! Thank you Charles. Why not. If you like the flavour of Merguez, go for it. Unfortunately I couldn’t do anything with my blog, because I tried to backup my Database on Bluehost but found it too complicated and gave up. A great combination! This savory tast must be very scrumptious. Perfect for taking on a picnic. A very delicious combination, Ivy. The cornmeal crust must be very crunchy. such a lovely tart! I have to bookmark it.